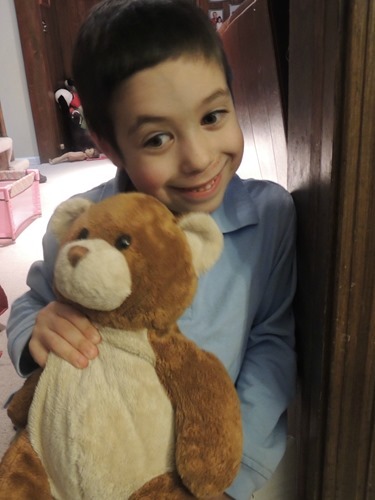 On Wednesday, it was Zachary’s turn to bring home Mr. Bear! Mr. Bear is a kindergarten favorite. The kids get to take turns bringing him home, spend time with him, and use their new writing skills to write about their day together. 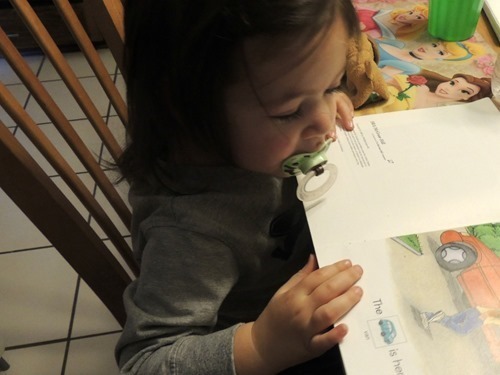 It is so cute and the kids get so excited for their turn! On the way home I drive Zachary and two of his friends so we were talking about how Mr. Bear got to come eat pizza on Tuesday night with another friend (I haven’t mentioned we now have a kosher pizza place open once per month – yum!) 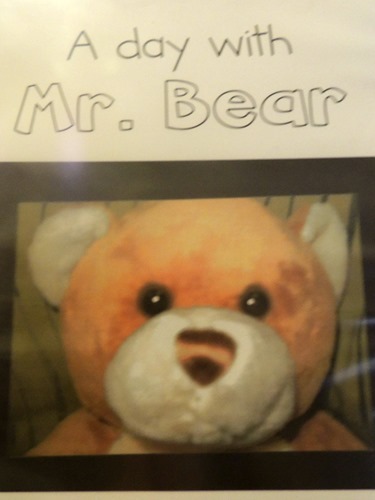 and how Mr. Bear gets to be Ms. Bear when he goes home with girls. 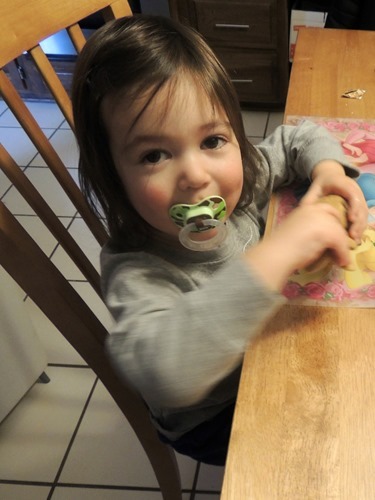 Five year olds are so cute. Zachary took Mr. Bear out of his bag and held him from the time I picked him up till the time he brought him back to school Thursday morning! Mr. Bear meets Rudy – that black blur you see at the bottom! 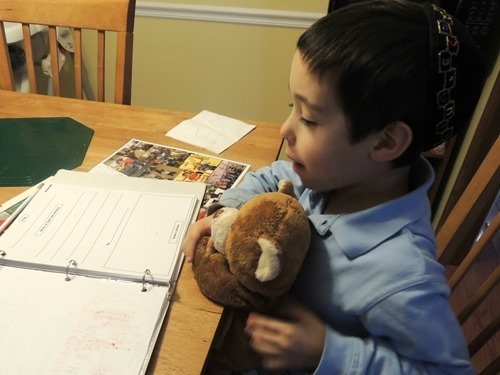 Zachary wasn’t sure what to write in the Mr. Bear notebook because they hadn’t done anything together yet! So he decided to do his other homework first. Simon was getting very jealous! 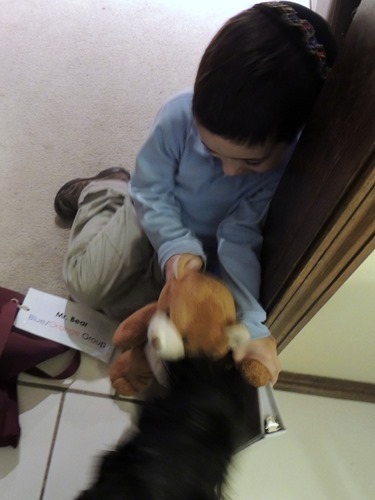 He wanted to hold Mr. Bear and he wanted to do homework too. 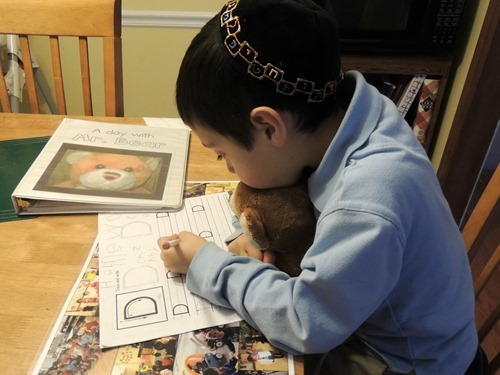 Finally Zachary was ready to write about his day with Mr. Bear. 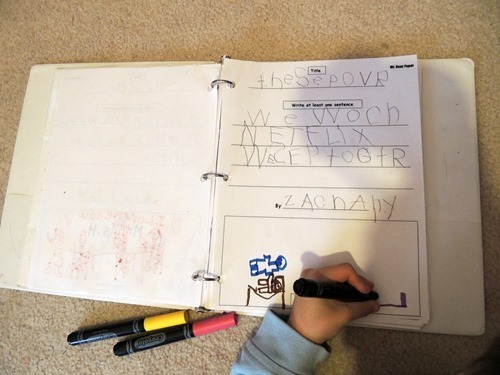 Zachary knew how to spell Netflix by copying it from the TV. He drew a picture of him sleeping with Mr. Bear and of Mr. Bear watching TV. 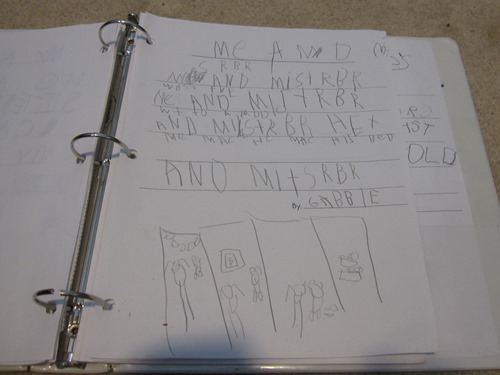 While Gabbie wrote more, it almost seems that Zachary’s writing is more advanced than hers was! Today both boys are home. Next year’s kindergarten class gets to come to school today so there’s no kindergarten. Preschool is off too. Wish me luck!